Whether you are a small local surf and paddleboards business just launching into the market or a surf and paddleboards company that has already been established for many years, 3PL Center has developed innovative third party logistics solutions and applied our passion to help you overcome tough fulfillment, packaging, warehousing, and distribution challenges. Our industry solutions are customized to your unique position in the surf and paddleboards marketplace, and can deliver high-impact efficiency for your business. Surfing and paddle-boarding is a growing industry. There are currently more than 30 million surfers and paddleboard enthusiasts around the world. The industry is expected to continue growing for the next decade or so. With the growing interest in surfing and paddle-boarding as a lifestyle sport, there will be more technological advancements in equipment. In addition, there will be growing prominence of performance surf wear as well as increased demand for hybrid and uniquely-shaped surfboards and paddleboards. Today, a growing number of youths and even mature adults are choosing to shop online for greater convenience. Unlike a brick and mortar store where customers can walk away with their purchase immediately after paying, e-commerce stores need to have a flawless supply chain flow in place to ensure customers receive their orders in an acceptable amount of time. 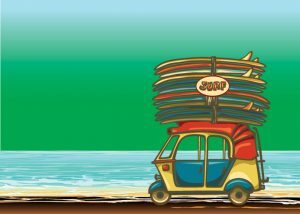 Many surf and paddleboards companies have chosen to partner with third party logistics providers as a result of increased demand in goods. Why Choose 3PL Center for Your Surf & Paddleboards Business? 3PL Center was founded more than six years ago, and we have a combined experience of more than 45 years across the team. Since our inception, we have earned our place as a reputable third party logistics provider for small to mid-sized to large organizations. We have worked with many surf and paddleboards businesses, and that’s why we fully understand what is needed for your business when it comes to third party logistics. Warehousing: Our warehousing facilities are designed in a way that we have an organized system to handle your surf and paddleboards inventory. All facilities in our premium-level warehouses are equipped with the latest security technology so that you can enjoy complete peace of mind. Fulfillment: Get real-time updates of your surf and paddleboards stock fulfillment status via our proprietary fulfillment software. Enjoy affordable and scalable fulfillment services that we provide. Distribution: Optimize your entire distribution process with our industry-leading solutions. Take advantage of our stellar transportation services to deliver your surf and paddleboards orders to customers and enjoy discounted carrier rates too! When you work with us for your surf and paddleboards 3PL needs, 100% customer satisfaction is guaranteed. If you seek flexibility in a certain 3PL service, our experienced team will be on-task to customize our 3PL solutions to accommodate your unique needs. Deliver your surf and paddleboard products in an organized and timely manner by using our third-party logistics services. Give us a call at 732-391-2500 or send us an email to sales@3plcenter.com today for more information.